Heat grill to high (450° to 550°). Mix seasonings in a small bowl. Put fish on a rimmed baking sheet; coat with oil. Sprinkle with seasonings. Thread fish on 6 to 8 slender metal skewers. Oil cooking grate, using tongs and a wad of oiled paper towels. Grill fish, covered, turning once, until just cooked through, 3 to 4 minutes total. 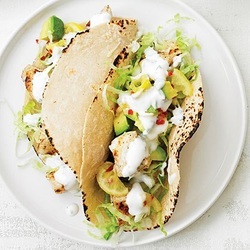 Fill tortillas with lettuce, tomato, avocado and fish. This picture features halibut with plain yogurt to finish!